Lunch in 15 minutes! Well-balanced delicious dish that has 3 parts (whole grain, vegetables, and protein). Barley can be cooked a day before. Just warm it up with a little bit of water and olive oil. Add fresh cilantro for enhanced taste and fresh energy. Tofu is a great plant-based protein. It must be organic to avoid genetically modified soy. Extra Firm tofu is the best for this dish. EASY to make, easy to digest, easy to fall in love with. Soak 1 cup barley for 6 – 10 hours. Put soaked barley in a cooking pot, add 2 cups of water, a pinch of sea salt. When it starts boiling remove foam, lower the flame, and cover with the lid. Cook for 35 – 40 minutes. All water will be absorbed by barley. Wiped tofu with paper towel. 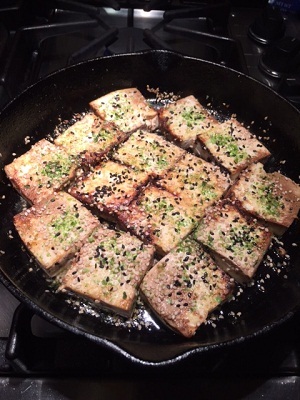 Cut 1 package of extra firm tofu into squares (as shown on the picture 1). Roll each piece in shoyu (organic, high quality soy sauce). Place into frying pan ( I use cast iron ), sprinkle with black and/or sesame seeds and nori flakes. Fry it for 10 minutes on both sides until golden brown (as shown on the picture 2) in sesame oil. Keep the flame medium/low so the tofu stays soft and juicy inside. Quick sauteed (3 – 5 minutes) red cabbage and green beans in olive oil and a little bit of water. Add lemon juice when serving.